I love the idea of a book advent calendar. 25 wrapped Christmas books, one to open each night and read before bed every night leading up to Christmas. So when Ben and I got married, I asked him to get me a Christmas book each year. I dream of having a huge wonderful collection one day that I can pass down to my kids. I want everything from spiritual Christmas books and kids Christmas books and all the classics. Now that we have Everett, instead of Ben giving me a Christmas book, Ben and I both pick one or two out for Everett. Last year, we got The Polar Express, and this year I have been pouring over Amazon and other lists to try and find the best ones. 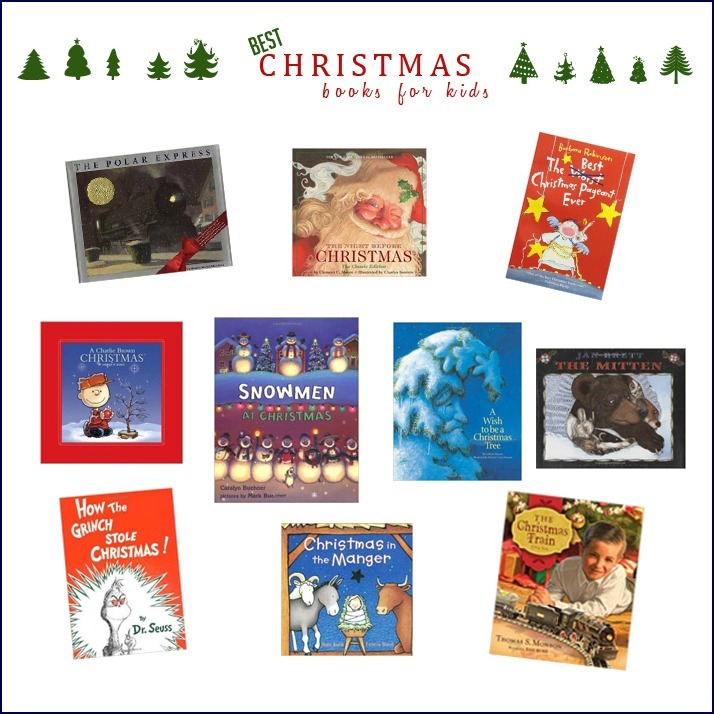 Here are a few kids Christmas books that seem to be the best from every list out there! 1. The Polar Express: Can't go wrong. I had actually never read this book until last year, can you believe that! Then I saw the movie and I fell in love with the story, the book is even better. 2.The Night Before Christmas: Do you know you could probably have a huge collection of just variations of this book, there are so so many out there. I'm a sucker for the classic version. 3. The Worst Best Christmas Pageant Ever: I can remember our teachers reading this to us in Elementary school and loving it. "The Herdmans are the worst kids in the history of the world. ..." Oh I love it! The Herdmans learn the Christmas story for the first time! 4: A Charlie Brown Christmas: Ben got this one for me a couple years ago and it gets me in the Christmas spirit! 5: Snowmen at Christmas: I think this is the one we will get for Everett this year. It is a cute story of how snowmen roll of our lawns in the middle of the night and go have their own Christmas all in time to get back to our houses for our Christmas mornings. The illustrations are so cute too! 6: A wish to be a Christmas Tree: A Tree in the woods is much too tall, so no one wants it as their Christmas tree, which is all this tree ever wanted to be. So all the animals in the woods get together and give him the best surprise he could ask for. 8: How the Grinch Stole Christmas: I don't really like Dr. Seuss books, but Christmas isn't Christmas without the Grinch. 9: Christmas in the Manger. A Little board book about the animals in the manger, very cute and simple for young toddlers. 10: The Christmas Train: A true story told by Thomas S. Monson and when he first learned the true meaning of Christmas and giving. You have to check out "The Littlest Angel". My grandpa reads it every year and it chokes me up big time! Good collection!! I love books too! We did this growing up and I think it's the best tradition!! And from brians family we got president monsons books last year.. So tend!